My Apothecary Chest: in 1994, it arrived via container to California from Hong Kong, where I discovered beading during an ex-pat assignment. Serves as the repository for my beads. Handcrafted. It has 52 Drawers, sorted by color. 2017 Challenge: Create a Necklace a Week, using only the Beads from one Drawer at a time. Voila! 52 Necklaces! 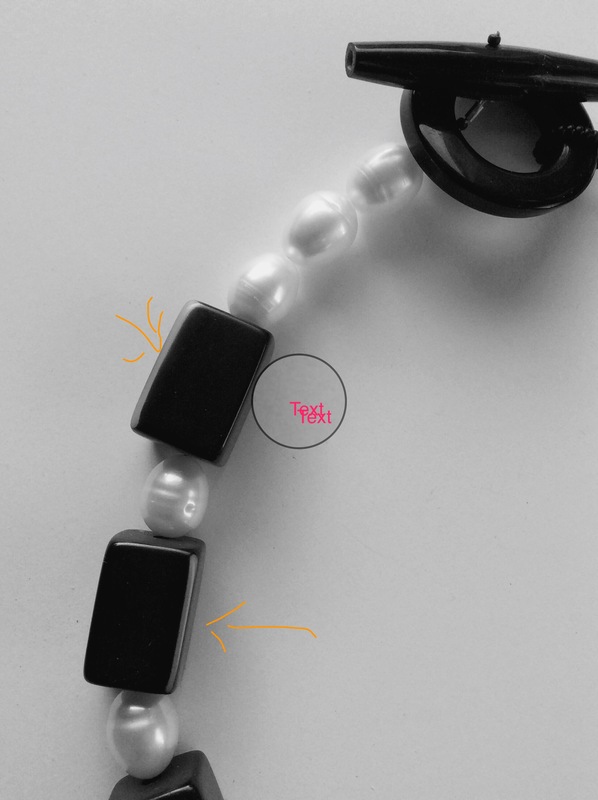 These shiny black beads spoke to me because of their unique white line down one corner. These are vintage resin beads and their shine has dulled as many hands have touched them over four decades or so. They are a product of the 70’s. I wouldn’t be surprised if the explanation for the white line had to do with the mold they were cast in and not some fabulous creative detail. But we shall not know because I cannot find any info on these beads and if there was a story when I bought them, it is now forgotten. Well, I’m a techie-in training, and I barely managed to draw orange arrows to show my readers the cool white lines, but I couldn’t get rid of the pesky “text” circle. Oh, well, enjoy and chuckle! There is a story in the white freshwater pearls: my friend Penny’s friend sent them to me to re-use. I fell for their heft, solidity and the fine markings etched by their life in a shell in warm water somewhere in Asia. They were re-used within a month of receipt; lightning speed for me who can hold beads for twenty years before finding a match! I have undoubtably mentioned my need to personalize my creations with an interesting clasp so the view from behind is as creative as the front. I estimate that this is possible in half of the necklaces I produce. This one features a black plastic elliptical circle with a black horn toggle. 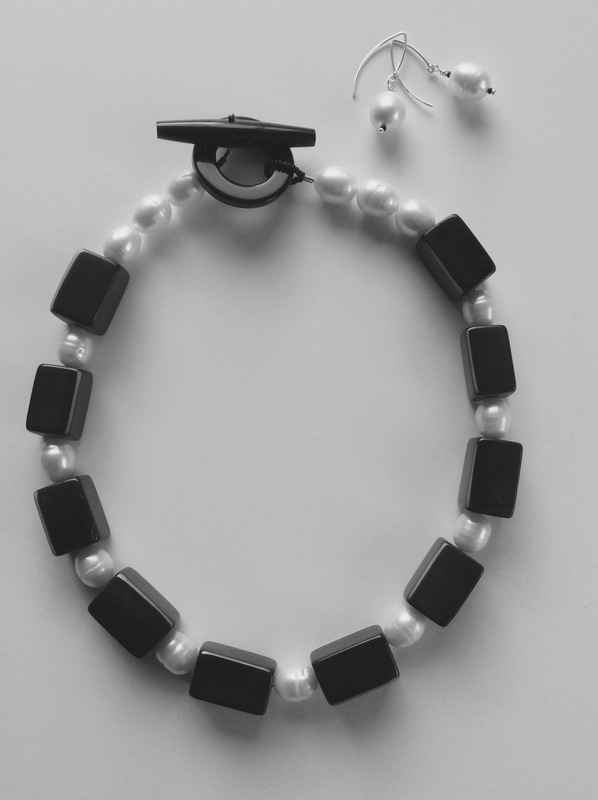 Three bold components in this neckpiece: rectangular beads, hefty pearls and a strong clasp! Just the way I like it! This strand is 19.5” and comes with matching pearl earrings on a modified hoop. $79. Can’t keep up with you! Another impressive piece! Love mine, have been wearing it on a simple black dress! Pretty cool, techie! I can see the lines! Thanks! But I won’t give up my day job (beading)!! !